The Roland DJ-505 is a two-channel controller for Serato DJ Pro. It takes features from Roland’s flagship DJ-808 that separates it from other Serato controllers on the market, including a step sequencer and drum machine, and puts it in a more portable form factor. If you are in the market for a mid-range Serato DJ Pro controller that is feature packed and gives you room to grow, the DJ-505 is a solid option. 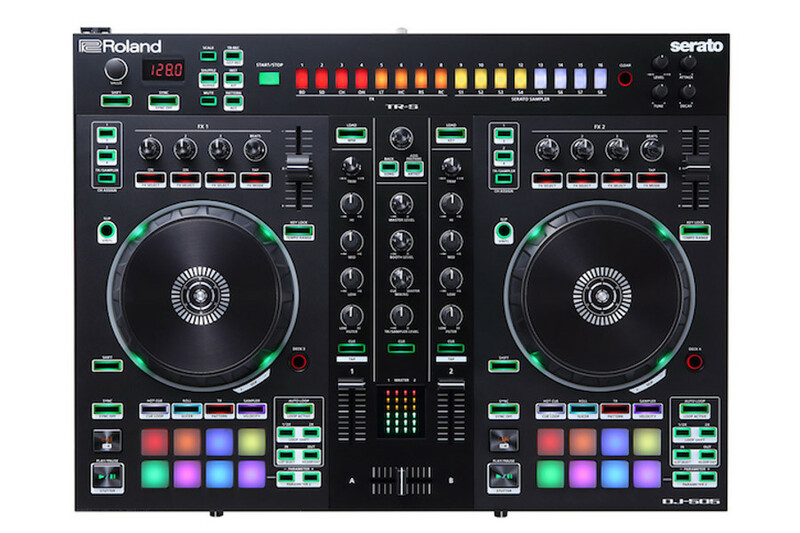 The DJ-505 follows the now-standard Serato DJ Pro controller layout while adding some features that cannot be found anywhere else besides Roland’s line of DJ controllers, which include the DJ-202 and DJ-808. At US$599 the DJ-505 presents a better value for DJs looking for tools that can help them stand out while keeping within a mid-range budget. The hardware itself feels pretty good. Despite it having an all-plastic construction, the controller feels solid while maintaining a light weight. All the buttons, knobs, and jogwheels feel responsive and feel like they are built to last. At its core, the DJ-505 is a Serato DJ Pro controller, and that means set up is a breeze. Serato has done a very good job at maintaining “plug and play” connectivity for most of its supported hardware, and the DJ-505 is no different. You just need to install the software, plug the DJ-505 into your computer, plug in some speakers, and you can basically start DJing. The DJ-505 also works as a standalone mixer, letting you connect up to two media players and turntables. The controller provides everything you need out of your first controller, and it leaves you room to grow and expand your setup while keeping the DJ-505 at the centre of it. Apart from being a DJ controller, it also works as a standalone mixer, letting you hook up two media players or turntables. The ability to access up to four decks as well as the ability to add DVS support means the DJ-505 can utilise the majority of Serato DJ Pro features while still maintaining a sub-US$1000 price point. The physical size of the DJ-505 is in line with other mid-range Serato DJ Pro controllers on the market. Featuring a two channel mixer section and two asymmetrical deck sections, anyone who has stepped in from of a Serato DJ Pro controller before should feel at home right away. 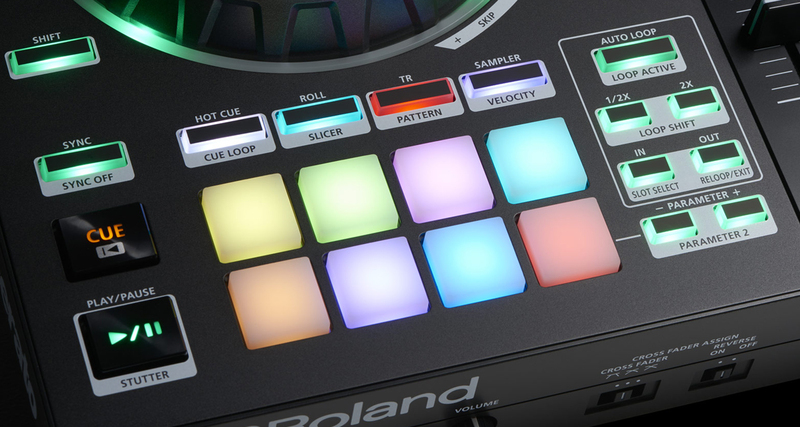 Where the DJ-505 stands out is in the addition of the Roland TR-S drum machine at the top of the unit. This lets you play drum sounds and sequence them on the fly, letting you augment a track that you’re playing by layering percussion and effects, or even letting you create a drum groove from scratch so you can mix into it during your set. Of course, its sequencing power makes the DJ-505 not just a DJ controller, but a viable piece of hardware in a producer’s studio setup. The biggest standout feature of the DJ-505 is the TR-S drum machine and sequencer, and how seamlessly it has been integrated into Serato DJ Pro. 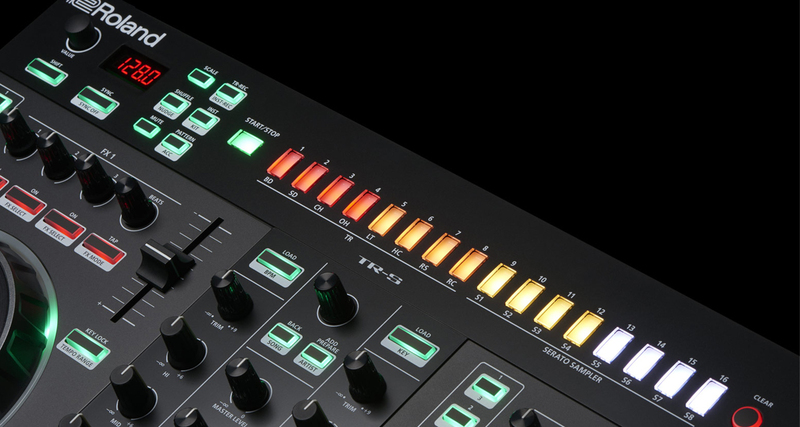 The TR-S features Roland’s Analog Circuit Behavior technology, and it brings the sounds of classic Roland drum machines such as the TR-808, TR-909, TR-707, TR-606 to the DJ-505. The TR-S also has a sequencer, letting you sequence the drum hits so you can come up with a beat, as well as controls to contour each of the sounds. As an extension of the TR-S drum machine, the DJ-505 features a Midi output that transforms this piece of gear from just being a DJ controller to what can be the brain of a complex live performance setup. The Midi output allows you to connect other Midi gear like a synthesiser and have them run in sync with the DJ-505. Imagine having the ability to add your own melodies using a synth while you DJ and sequence drum sounds using the onboard TR-S sequencer. That kind of power currently is only available on Roland’s controllers. 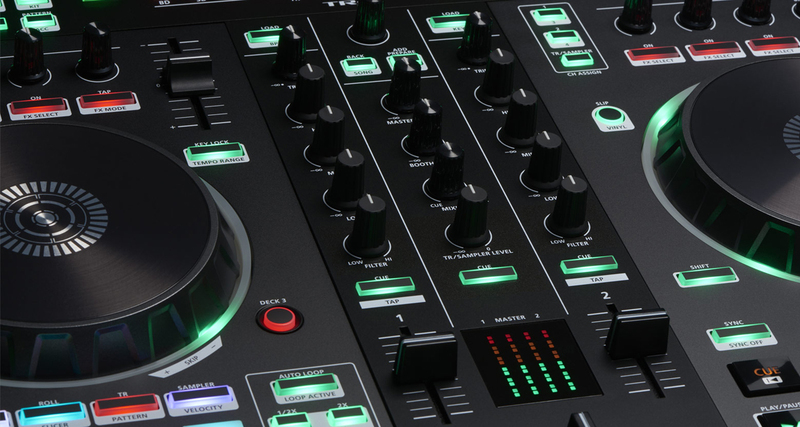 The mixer controls on the DJ-505 are standard. Each channel has a trim control, three-band full kill EQs, and a High Pass/Low Pass filter. Below these you’ll find channel faders for each deck, LED metering for each channel as well as the master output, and a crossfader at the bottom. One nice addition to the DJ-505 is the inclusion of physical curve and reverse controls of the crossfader, which is something that is rarely seen on a controller at this price. The DJ-505 features pretty much all the inputs and outputs that an intermediate DJ would need. You get XLR and RCA master outputs, 1/4″ booth outputs, as well as a 1/4″ mic input. It also has two RCA inputs that are phono/line switchable meaning you can hook up either media players or turntables. The DJ-505 has what has become the “standard” Serato DJ Pro deck section layout, with FX controls at the top along with a pitch fader, the jogwheel at the centre of the deck, and performance pads and transport controls at the bottom. The jogwheels on the DJ-505 are a good size and have a solid feel. They do have a bit more tension than the jogwheels you would find on Pioneer DJ controllers, but are still very smooth and nice to scratch and pitch bend with. One big difference with the DJ-505 is the different performance pad modes. While it does have some of the standard modes you find on Serato DJ Pro controllers such as Hot Cue, Roll, and Slicer, it also features modes exclusive to Roland DJ controllers such as the TR and Pattern modes. These two performance pad modes are used to control the DJ-505’s drum machine functions. The TR mode allows you to trigger the sounds of TR-S drum machine much in the same way a user could trigger the sounds in the Serato Sampler. The pattern mode lets you not only sequence the TR-S drum machine, but also sequence sounds loaded into the Serato Sampler. That means you can could load up to 32 different drum sounds, loops or samples, and have them follow the tempo of the other decks playing. Roland burst onto the DJ market a few years back, debuting Serato DJ controllers at the beginner (DJ-202), intermediate (DJ-505) and advanced (DJ-808) levels, and to me the DJ-505 hits the sweet spot. It takes many of the more forward-thinking performance features of the DJ-808 while having a smaller form factor and a lower price tag. Even if you removed the extra live performance features of the DJ-505, it’s still a solid mid-range Serato DJ Pro controller that shares the same basic features of its Pioneer DJ counterpart (eg Pioneer DDJ-SR2) and comes in at a cheaper price. If you are in the market for a mid-range Serato DJ Pro controller that is portable, feature packed, and allows you room to grow, the Roland DJ-505 is a good pick. 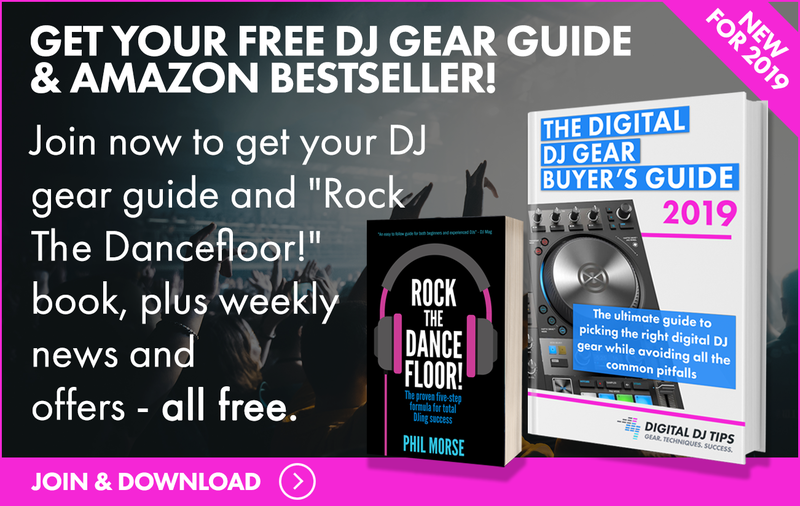 It checks all the boxes for any DJ just starting as well as more experienced DJs who are looking to take their DJ performances to the next level. “While it does have some of the standard modes you find on Serato DJ Pro controllers”…. Actually is has all of the performance pad modes. It doesn’t show it on the top plate of the unit but each button has 3 modes, ‘1st press’, ‘2nd press’, ‘shift+1st press’. The Slicer even has 4 modes, additionally ‘Shift+2nd press’. I’m looking to upgrade from the ddj sr2, is there any other ones you can recommend other than this?